Over time, usage will cause the edges of the block to round, causing the torque wrench to click at an incorrect setting. Calibrated tools can and do wear out over time. How quickly this happens depends upon the quality and type of tool along with storage practices and environmental conditions. Physical or dimensional tools have moving parts that degrade or become distorted and electronic tools have components that change value. The quality of materials used to manufacture the spring and block inside a click-style torque wrench can influence the accuracy of the wrench over its lifetime. The spring can lose its shape or compress differently depending on usage and storage. The highest torque setting keeps the spring in a compressed state. When the setting is lowered the spring may not return to its original shape, therefore causing incorrect readings. The pivot block inside the unit is a rectangular block of metal. Over time, usage will cause the edges of the block to round, causing the torque wrench to click at an incorrect setting. When calibrated tools are not in use, the recommended setting for storing a torque wrench is at the 20% setting. If torque wrenches are stored on their highest setting for an extended period of time the spring may not fully decompress. On the other extreme, if the torque wrench is stored at the 0 setting, the pivot block can become tipped or roll. 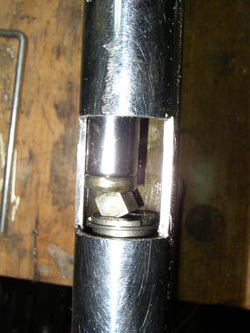 The slight tension on the spring is necessary to keep the pivot block in place without distorting the spring. Environmental conditions (temperature and humidity), internal heat, severity of abuse and age will cause electrical components inside electronic test equipment to deteriorate and change in value. This change in value changes the overall accuracy of the test equipment. However, during calibration, internal adjustments in most electrical test equipment can bring them back to their nominal settings. A low battery can also have a negative impact on the accuracy of meters. When the low battery indicator is on (most meters have these), the battery should be changed soon. Most calibrations are performed annually to verify normal deterioration of the tools do not change the readings so far that they are out of the published tolerances. If the unit is near or outside the tolerance, the calibration technician can make the adjustments to bring the readings back to the nominal settings. If the tool is at or near the tolerance for multiple calibrations, the tool may need to be calibrated more than once a year. At Duncan Aviation, we see many tools with reduced cycle times. Calibrating them more than once a year limits the number of times the unit is found out of tolerance. When the tool passes calibration it is given a clean bill of health in the form of a calibration certificate. The calibration certificate states the tool was found “in-tolerance”, “out-of-tolerance” or if any limitation tolerance exist. The certificate should also have a date scheduled for its next check up. Sometimes, even with the best efforts, the tool cannot be brought into the specified tolerance. At this time the tool can be given a limitation. A limitation says the unit passes the calibration, but within a new tolerance. The limitation is noted on the certificate and the tool so the owner is aware of the tool’s limitation. If you have any questions or comments, contact Duncan Calibration Services at 402.479.1698.